Marijuana stocks are hot topic right now. Cannabis related investments have been a big topic for a while, but since January 1st, California has gone legal from a recreational stand point. Virtually overnight, the cannabis market grew exponentially, and it is projected that California will sell almost 50% of all legal U.S. pot. The U.S. pot market is expected to grow from $6.5 billion to $50 billion by 2026. That would make it the same size as the American craft beer and chocolate markets combined according to Market Watch. Now, before we get too excited and wrapped up in the hype let's keep something in mind. Cannabis is a speculative, emerging type of investment. Investing in such categories is only for the individual that is comfortable with risk and can afford the uncertainty, as well as the potential volatility. Many of the rules are just getting formulated and a lot of them will change. Most likely, there will be more losers than winners. So, investor beware. Our goal is to help teach you how to do some due diligence before considering putting any hard earned capital to work in Cannabis related companies. We work day in and day out with a focus on teaching investors how they can manage the risks associated with investing. In this video we will educate you about the opportunities that exist in the fast growing cannabis industry while also teaching you how to protect yourself from the risks associated. Request more information on what we are watching. This chart is something that I share with people all the time. 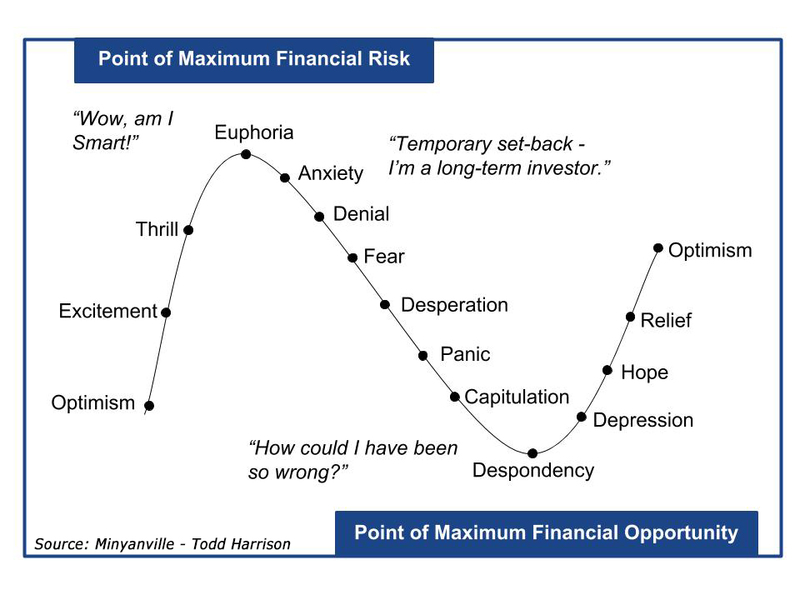 The Denial-Panic Continuum can happen in a market over a period months and years, but it can also happen in individual investments. In the world of cannabis, you are having a little bit of the same thing. A good example is maybe somebody who got involved in the market in 2012-2013, a couple years after the financial crisis. They start to put money to work, they start off with optimism. How do you know you are getting into one of those cycles? Things that are very esoteric start to become valuable- take cryptocurrencies, for example. I saw the same thing in 98-2000, in the Dot-Com era. During the Dot-Com era, even if a company wasn’t involved in the internet or technology, if they threw Dot-Com behind their name their stock just raced up higher. We saw this in the last week or two, we have seen companies that have nothing to do with cryptocurrencies come out and just put “blockchain” or something like that in their name, and their stock rises. That stuff only happens when you are getting to a point of euphoria. People trying to make a fortune, everybody wants to make a quick buck. I believe as time progresses and you start to evolve from 28-29 states that have some kind of legality of cannabis to more states adding on, you are going to see this peak-valley type of process in the cannabis stocks more often. At the end of the day, stocks and the stock market are about supply and demand- when a company issues stock, they have a limited number of shares that they issue. As there are more people that want to buy it the price goes up. What should happen over time, as a state like California comes out with a new regulation, in this case legalization for recreational use, you get a big fury into those stocks. Even with the news that came out earlier this week, with Jeff Sessions shooting a little bit of a warning shot across this industry, the hit that happened in those stocks yesterday was very minor compared to the rise that they have had in the last two weeks. So as you come up to the mid-term election, I would imagine, depending upon which states have some kind of ballot initiative, you may get another run in these kind of names. As time progresses, this industry will mature. What’s happening right now is what we call price-discovery and so in that process of price discovery these stocks related to the cannabis field are going to go through this continuum many times and in a very fast pace. "Price-discovery" is another way of saying volatility, and we believe this is going to continue. As time progressed, how did cannabis fall out of favor? How did it become illegal? As you can see, Cannabis is not a new commodity- people have been using cannabis for food, textiles, and medicine for literally thousands of years. Only in recent history have we been able to perform studies that back up this ancient medical wisdom. Today, the United States FDA has approved two drugs that are THC-based for medicinal use that are focused for cancer nausea, one that is called Marinol and the other Syndros. To understand how we got here, it helps to look back at the history. It really started to come into the US heavily in the early 1900's, when a lot of hispanics or Mexicans were migrating into the US during the Mexican Revolution. Cannabis starts coming over the border, and then we go through the Great Depression. Leading up to the Great Depression was the Golden Ages, the time of excess- What was happening then, there was a push-back against everything that was considered excess- we went into the prohibition of alcohol. This was kind of a perfect storm in the 20's and 30's - where you had a political situation where people in the US were starting to get irritated by this influx of Mexican immigrants- they were associating Cannabis and weed with that, there was already this social push against alcohol and drugs and things of that nature. Then the world of finance came in and really puts the cap on the prohibition. Back then, in the early 30's there was a guy, who happened to be the wealthiest guy in the US at the time- His last name of Melon. He was also the Treasury Secretary at the time. Melon had a couple friends with the last name DuPont. This family had just come out with a new fabric, a new synthetic material called Nylon, and hemp was a direct competitor with Nylon. So lo-and-behold, in 1937 we have the Marijuana Tax Act. The prohibition of marijuana deepens and strengthens. At that point, there was no studies into hemp. In the 1940's when our hemp supplier, the Philippines, fell to Japan, we briefly turned and allowed hemp to come back into the country and we encouraged communities to grow hemp for building materials. Then, in the Nixon years, in the 1970s, we started pushing back against the craze of the drug use from the 1960's. In 1970 is when the drug act really came out that listed Marijuana, LSD, Cocaine, etc all as Schedule 1 drugs. It was as early as 1972 that there were all sorts of reports coming out saying, we have made a mistake, marijuana shouldn't be on that list, but the cast had already been set. In 1996, the Compassionate Use Act was passed in California to allow Medical Marijuana. Now, you go forward, 2012 was the first year that we had two states went legal for recreation, Washington and Colorado. As it sits today, you have 29 states that have either decriminalized cannabis, or made it legal for either medical or recreational use. This is really important, and this is the reason I want to give you the history. I believe we are at a tipping point where all this past and the past stigma of this stuff gets thrown to the wayside. Worldwide, Canada, the Netherlands, Australia, Croatia, Brazil, Israel- all these countries are beginning to change how they view cannabis. As the old idealisms of Cannabis fall off, it will affect the demand, and the price, as mentioned above. The investment thesis is not about the recreational use- It is about the medical use. Here is one way to view the human endocannabinoid system, which is a system that impacts the physiological processes affecting pain modulation, memory, appetite, anti-inflammatory response and immune system responses. This gives a good basic view of how THC, CBD and CBN act in the body and specifically with receptors in the body that are termed CB1 and CB2. CB1 receptors are primarily found in the brain and central nervous system, CB2 receptors are mostly in peripheral organs and cells associated with the immune system. In a lot of cases its not about these cannabinoids replacing a way of doing medicine, but in some ways it is a supplement to it. 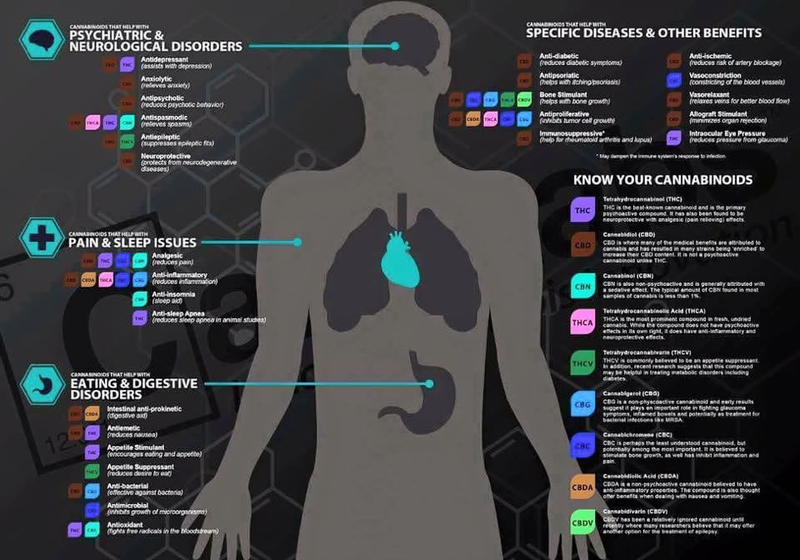 Here is another look, a legend of how the various Cannabinoids affect certain areas of your body. It seems that the biggest or more talked about trends when it comes to CBD’s and medical science is in the realm of epilepsy, cancer, pain and inflammation management, glaucoma and diabetes as well as many others. You have companies like GWPharma from Great Britain that are working on epilepsy treatments that are CBD-based or Insyte Pharma that is using CBD's in studies for pain management to help solve the opioid issue. For years ,we have known it was helpful with glaucoma because CBD and THC are dilators, meaning they dilate or open blood vessels, promoting more blood flow which is why you may get the red or blood-shot eyes, and also why cannabis can lower blood pressure, while increasing the heart rate in some people. 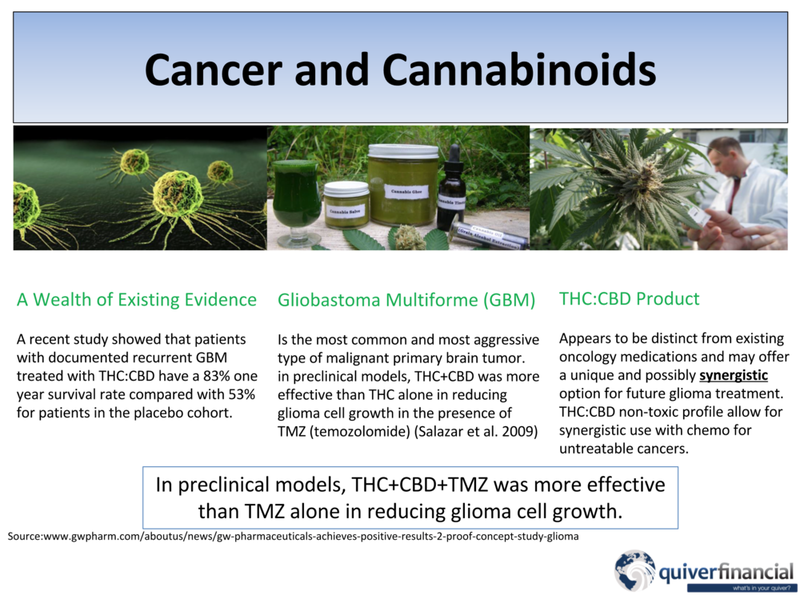 There is also quite a bit of evidence that THC, CBD, along with traditional Chemotherapy combined can be more effective together than when they are used just alone for stubborn tumors. In fact, A recent study showed that patients with documented recurrent GBM treated with THC:CBD have a 83% one year survival rate compared with 53% for patients in the placebo cohort. Current industry estimates report annual hemp based product sales at more than $800 million annually, with approximately 50,000 products and growing at approx. 20% per year. Nutraceuticals & Food - NESTLE is Clinically testing a cannabinoid-based food additive to be safe for IBS sufferers. Global Nutraceuticals market said to reach 204.8 Billion by 2017. "The legal cannabis market is forecast to be fastest growing industry in America." This double digit growth rate is expected to continue in the foreseeable future as more states legalize medical and recreational use. Many are claiming that the cannabis market will be the fastest growing industry in America. When you track past sales to now and what is projected for the next few years it is hard to argue that it isn’t a growth industry, especially when you consider 28 states have legalized some form of cannabis use and it appears more states are to follow. Here is a visual for you to see which states have legalized medical and or recreational use. This doesn’t include the states that currently have reform laws pending. When you look at how the opinion has changed over the years its hard to believe the remaining states, and then the Federal laws won't follow. Here is a generational view of opinions on whether cannabis should be legalized. 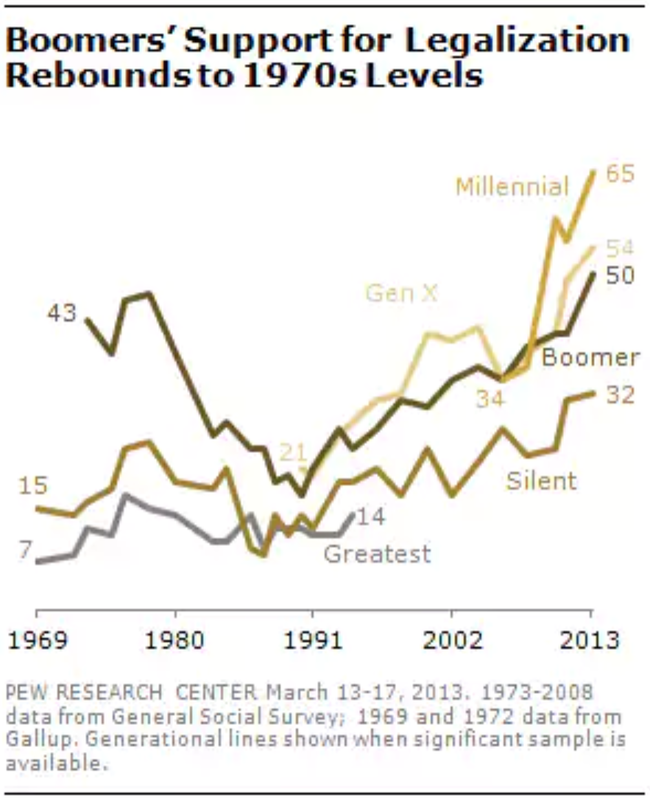 Its as of 2013, for the Pew Research Center, and I imagine if this were to be redone in current time the numbers would be higher. According to a January 2018 poll by Pew Research, the overall American view as 61% in favor of legalization. All this is exciting stuff, but how do we turn it into investments opportunities because in the meantime? You still have a substance that is illegal from a Federal standpoint, so you have to be very careful not to invest into an organization that is breaking Federal rules, and by default could wrangle you into a legal issue. Also remember there will be all kinds of snakes and vipers slithering around in these grasses putting together private investments with no experience, or worse, with bad intentions. Because of this, I think investors should focus on the health side and go with the mantra that its about getting well not getting high. And if you go with that thesis it should lead you to some publicly traded companies whose focus is on the medical not the recreational side of the business. -The S&P 500 Index is a market-value weighted index consisting of 500 widely held U.S. stocks chosen for market size, liquidity, and industry group representation. Performance is compounded, distributions reinvested. Past performance does not guarantee future results. -The Dow Jones Industrial Average Index is an un-managed, price-weighted index of 30 common blue chip stocks, comprised of major industrial companies. Performance is compounded, distributions reinvested. Past performance does not guarantee future results. - Information contained in this presentation does not represent any specific investment recommendation. - There are risks inherent in investing in the stock market. Price value will fluctuate.